It must be well over thirty years ago that I made a speculative purchase of an LP recording of a symphony which at that time, I’d never heard. The work in question was the Second Symphony of Wilhelm Stenhammar and the performance I acquired was the 1978 Caprice recording by Stig Westerberg and the Stockholm Philharmonic. Some years later I was able to buy it on CD (CAP 21151) and it has remained my favourite version of this life-enhancing score, even though other very good recordings have since come along, including two by Neeme Järvi with the Gothenburg Symphony. His 1983 recordnig can be found in a BIS boxed set (review) and it's also available as a single disc (BIS-251 CD). In addition, it is included in a valuable set from Brilliant Classics. There's also his 1993 version (DG 445 857-2). Now, hot on the heels of the 2017 recording by Christian Lindberg, which I’ve not yet heard (review ~ review) BIS offer another performance, captured at live performances in 2013. Herbert Blomstedt was born in July 1927, meaning that he was 86 when these performances were given. I wouldn’t normally think it relevant to mention a conductor’s age but I think it’s appropriate on this occasion because it doesn’t seem that the years have diminished Blomstedt’s vitality in any way whatsoever. Indeed, as I typed the preceding sentence I was reminded that at the beginning of 2013 I saw him in action in Birmingham and, looking up my review, I see that I described him as “a wise musical elder statesman” and I commented “Herbert Blomstedt will be 86 later this year. To be honest, he looks like a man ten or fifteen years younger and there’s absolutely no suggestion of advancing years in his conducting.” Well, this SACD offers further evidence to that effect. Stenhammar’s Second Symphony took him four years to compose. I don’t know whether the long gestation period was a product of his busy schedule, including the composition of his Serenade in F, or if the symphony was difficult to write. If the latter, then the listener wouldn’t know because it flows so well from start to finish. The first movement is founded principally on a sturdy, perhaps rustic, dance-like theme which Blomstedt paces acutely. The more relaxed secondary theme (1:39) and all that flows from it during the movement is given just the right amount of space. Blomstedt imparts a genuinely open-air feel to the music, though he brings suitable rigour to the many contrapuntal passages (for example from 5:30). The BIS recording, to which I listened as a stereo SACD, is marvellous, giving great clarity and also a most welcome airy concert hall perspective. It’s not just the engineers who produce the clarity, though; so do Blomstedt and his players. As an example, listen to the pp double basses around 6:30. A genuine pianissimo is achieved yet the bass figuration can be clearly discerned throughout this passage. For a comparison to this performance the Westerberg was the obvious choice. His recording, which is now 40 years old, is more closely balanced and, probably as a consequence, his double basses aren’t quite so hushed at this point – but neither are they so distinct. Perhaps Westerberg is a fraction more urgent than Blomstedt occasionally in this movement; overall, though, I find Blomstedt, who mixes vigour and relaxation in an ideal fashion, wholly convincing. The second movement is a slow march which, to my ears, has Elgarian echoes at times. Blomstedt unfolds the music very naturally. The scherzo which follows is lithe and graceful in Blomstedt’s hands. Westerberg’s performance is also very successful and if he appears to invest the music with greater urgency at times that impression may be, at least in part, a consequence of his closer-balanced recording. Blomstedt’s account of the music is delightful and cheerful. The slower trio (2:10-5:19) is dominated by the horns and woodwind and the Gothenburg players phrase it with great care. The slow introduction to the finale has nobility and power in Blomstedt’s hands. Westerberg is a bit broader in his pacing and I think he’s even more successful in bringing out the Sibelian legendary grandeur. The first fugue (1:53 in Blomstedt’s performance) is very sprightly and, as in the first movement, he achieves admirable contrapuntal clarity. Westerberg is no less admirable and his treatment of the music is just as lively. I love the hushed way in which the clarinets introduce the second, slower fugue for Blomstedt (5:45); in Westerberg’s case the instruments, more closely recorded, are not so quiet. As the movement unfolds Stenhammar shows great skill in weaving together both of his fugues into a coherent and exciting whole. The highpoint of the movement, to which all this fugal activity has been leading is a passionato episode (10:16-11;25 in Blomstedt’s performance). I relished the unforced ardour with which Blomstedt puts this passage across. Westerberg also lifts the spirits at this point (11:32-12:41); however, his recorded sound imparts a fierceness in the build-up to that passage, though I’m certain that the Stockholm Philharmonic didn’t actually play the music fiercely. Blomstedt brings the symphony home in splendid fashion. The Westerberg recording remains a marvellous performance and it’s one that I have no intention of discarding. However, his forty-year old recording, though still more than acceptable, must yield before the BIS digital sound. The closer balance on the Caprice recording doesn’t always flatter the Stockholm Philharmonic and their strings, as recorded, have a rather wiry sound. Interpretatively, the magnificent new Blomstedt performance represents the strongest challenge to Westerberg among versions that I’ve heard and, overall, I would now regard it as a clear first choice. The Serenade was initially contemporaneous with the Symphony but Stenhammar later revised it quite significantly. One of several major changes was the complete excision of the second movement, entitled Reverenza. It’s a charming little movement and I’ve heard a number of standalone recordings of it. Neeme Järvi has recorded the Serenade twice: it’s included, in the revised version, in the DG set I referenced earlier in this review and previously he’d also recorded the six-movement version of the work (review). 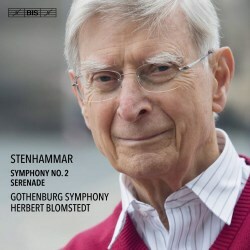 However, I think Stenhammar was wise to cut Reverenza and because Herbert Blomstedt respects the composer’s final thoughts on this matter BIS have been able to include his performance on this very generously filled disc. It’s not all that long ago that I enjoyed very much another BIS recording of the Serenade, conducted by Christian Lindberg (review). Using it as my comparator on this occasion reminded me how fine it is. One important difference, though, is the sound. As you might expect, BIS give Lindberg a splendid recording. However, his recording, made under studio conditions, I think, is rather more closely balanced than the Blomstedt. This brings dividends in terms of impact and detail but the Blomstedt recording is not lacking in those respects and some listeners may prefer the more natural, and slightly more distanced, Gothenburg recording. Annotator Tomas Block wonders if the unusual marking of Allegrissimo that Stenhammar employs for the first movement might be taken to mean ’with the greatest happiness’. That’s a plausible view, I think, and certainly that’s the impression Blomstedt conveys in the quick sections of this movement. To add to the listener’s pleasure, he shapes the slower episodes beautifully. This is a super start to Blomstedt’s account of the Serenade though Lindberg, too, lays out the movement very successfully and idiomatically. The next three movements, Canzonetta, Scherzo and Notturno are meant to follow each other attacca though there’s slightly more space between the movements on the Blomstedt recording as compared with Lindberg. The younger conductor is more measured in the Canzonetta, taking 5:54, whereas Blomstedt takes 4:59. I like very much Lindberg’s reflective approach to the music but now, hearing the Blomstedt, I find that his more forward-moving pace brings sophisticated innocence and charm to the movement. In short, the new account is captivating. The orchestra plays with great finesse and a passage that particularly caught my ear was the one beginning at 1:54 where solo violin and cello have a lovely exchange against the most delicate of orchestral backgrounds; this ravishes the ear. I like Tomas Block’s description of the Scherzo as ‘a nocturnal bacchanale’. Both performances are splendid, though I think the somewhat more distanced Blomstedt recording means that his version has the better ambience. Blomstedt’s performance of the Notturno which follows is warmly affectionate and very atmospheric. In achieving a truly distinguished performance he’s helped no end by the super playing that the Gothernburgers offer him. The Lindberg performance is also very fine but for purely subjective reasons I now prefer Blomstedt. The finale is, for the most part, infectiously good-natured though the movement is not without its reflective moments. Both of our conductors lead excellent performances. I don’t resile from my admiration for the Lindberg recording. However, I think Blomstedt now edges it in my affections. There are two reasons for this. One is that I prefer the live Gothenburg sound to the (also excellent) sound that BIS afford Lindberg. The other is that Blomstedt’s way with the Canzonetta is utterly winning. This is an outstanding disc which all lovers of the music of Wilhelm Stenhammar should hear. I think that both works are new to Herbert Blomstedt’s discography and I’m thrilled not only that he’s now recorded them but also that he’s given us performances of such distinction. And how fitting it is that the orchestra involved should be the Gothenburg Symphony, since Stenhammar was the orchestra’s principal conductor from 1907 to 1922; not only did they give the premiere of the Second Symphony but also Stenhammar dedicated it to the orchestra. As usual with a BIS release, production values are high. As I’ve indicated already, the recorded sound is excellent and despite the long playing time of the disc I detected no diminution in sound quality. The notes by Tomas Block are very good. BIS have recycled the portion of his note dealing with the Serenade from the Lindberg disc but why not: the note is excellent so why reinvent the wheel?